The battle for 2nd place continues in WGLNA Season 2. The war for 2nd place and the free bye that comes with it were the driving forces behind Tuesday’s match as eClipse faced Top Tier. With last season’s runners up only one point ahead, this match would have massive repercussions in the standings. Either eClipse would be able to create some point distance from Top Tier and force Dare Rising to have to win to keep up, or Top Tier could potentially leap frog and a take 2nd place for the first time this season. The second match of the night would put the 8th place Rival – SimpleTankers in a rough match against our reigning WGLNA champions and league leaders, Apex. 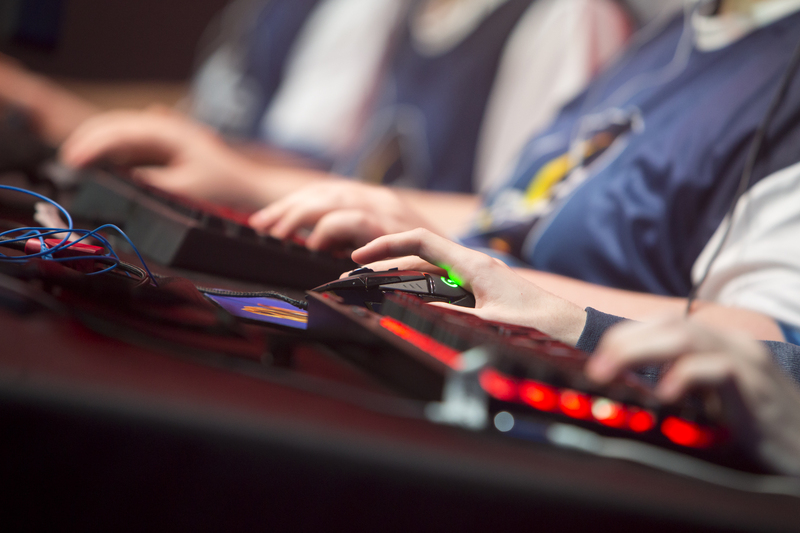 As WGLNA Season 2 has progressed, teams have found themselves facing challenges on and off the battlefield. This is especially true for eClipse. Not only did Vetro leave to join Apex, but Exo departed as well, which was announced during the faceoffs. They did manage to pick up Ledif, another standout player from o7, to help shore up the side. The question was, would Top Tier be able to take full advantage of this potential opportunity? The first map of the night was Ghost Town. Right of the gate, both teams probed for the advantage. At the 4:30 mark, eClipse found their shots and moved in to finish off Top Tier in a match of feints and swift rotations to take the 1-0 lead. Even after dropping the first match, Top Tier didn’t seem bothered in the least as they entered the next battle. Action picked up just past the halfway mark as eClipse began a rotation around the center cap area while holding the HP lead. Top Tier’s Xits (pronounced “exits”), Mereelskirata, and Pompus would more than step up to the challenge, taking the map landing needed and clutch shots to tie up the match 1-1. Match 3 would find both teams on Murovanka. Athough the defender statistically has the advantage, eClipse appeared to have an even greater edge. Early on they were right on point on their defense as they were more than ready to spoil Top Tiers attacks. In the end, eClipse would take the win and the 2-1 lead. The shoe would now be on the other foot as Top Tier went on defense. While eClipse knew there was a scout in one of the bushes, they took a great deal of time placing blind fire into almost every piece of vegetation around. Tigers eventually charged in to take out Rude, while incurring many shots in the process. With the capture point clear of scouts, eClipse started to cap. However, Top Tier had already begun to rotate from the west cap, swinging into the mid area as well as up and around the north side of the forest. This sharp series of moves would give Top Tier the advantage, allowing them to ultimately win the battle to tie up the score 2-2. Himmelsdorf was the next match on tap. Early moves had Top Tier on the advantage as they started to box in eClipse in the southern side of the map. However, at that moment T1_Diabetic and his FV 4005 unleashed on and deleted a tank. Any advantage though may have been given away and NoNickNoSkill ended up crashing and killing his Bat-Chat. T1 would land a few more shots, helping give his team a slight edge. As the battle neared the end, eClipse had three players left against Top Tier’s last man standing, ogHako. In the IS4, ogHako dispatched Drawk quickly, leaving him to face eClipse’s remaining two players, PhotoFinish and T1_Diabetic. PhotoFinish and ogHako dueled it out, both considered to be some of the best Heavy tank players in the league. T1 was rushing down to support Photo, but by the time he arrived, ogHako had finished off Photo and then managed to take down T1 to secure the win. This put Top Tier in the lead with a score of 3-2. Top Tier would hold on to that momentum and take the second match on Himmelsdorf as well, maintaining their 4-2 lead. This was exactly the same score as the last time both teams played each other when eClipse mounted an effective comeback. This time, Match 7 was on Ruinberg. At the start of the match, Top Tier attempted to rush maps across the open area near the north cap. It did not end well, as eClipse was placed perfectly to decimate the rush. This would lead to eClipse being able to reset cap a few times and in the end take the win, making the score 3-4. In the second battle of Ruinberg, Top Tier would not be denied as they played an effective defense. They secured the match and series win with a score of 5-3. This victory puts Top Tier in 2nd place now, though eClipse still have a game in hand. We were able to catch up with Top Tier’s captain, Rude_Awakening, for his comments on their win. While this looked to be the most lopsided match up of the second round-robin, the match still had to be played. Jsmooth took the opportunity in the face off to discuss WGLNA “love connections” in his own distinct style, even cracking up the always serious Comps a few times. The first map was Mines and we immediately saw that Apex was planning to tryout some new tank lineups. They came in with four IS4’s, which was more than enough to take the first match. In the second Mines battle, Apex picked 2 Maus’ and moved them over to the east to capture the base, along with a 2-0 lead. Ghost Town would be the moment where Apex tried for four Maus tanks, but it was Rival – SimpleTankers who got the win to make the score 1-2. The second go on this map would have just one Maus for Apex, but they brought along two Jagd E-100s instead. This proved to be more than enough to take the match and a 3-1 lead. Many folks in chat were now very interested in what lineups would come next out of Apex, and they did not disappoint. Apex rolled into Ruinberg in five FV215b’s, a FV215b 183 “Death Star”, and a Crusader SP. It proved very effective as they aced the match, taking it without losing a single vehicle. Match point would be almost just as clinical, as Apex won both the final match and the series with a score of 5-1. The team played well, and Vetro, in his first match as part of Apex, seemed to fit in with no issues. Match Night 12 may be remembered as the date when eClipse was knocked out of 2nd place. 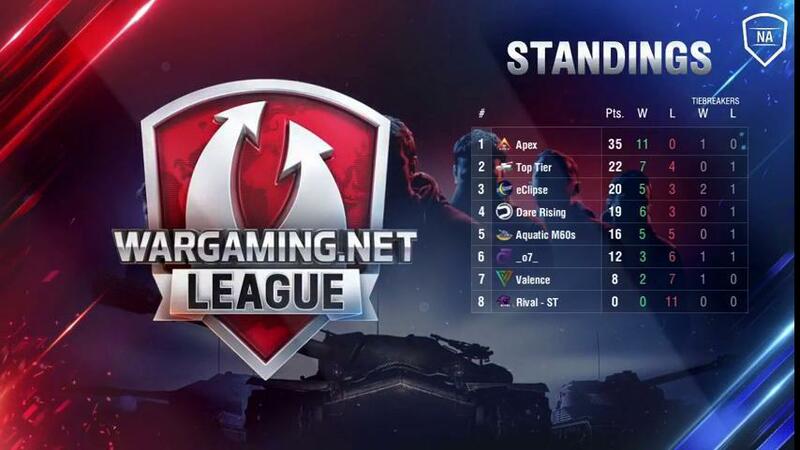 However, we must all remember eClipse still has a game in hand as well, and that Dare Rising and Aquatic M60s are both in this race for the bye into the WGLNA finals. Dare Rising will be facing eClipse this Thursday, February 16th, and that again will be another major determiner in the race for second. Please join us for this match along with the showdown between Valence and Rival – Simple Tankers on Night 13. Be sure to tune in to live.wgleague.net for all the action as we enter the final stretch of WGLNA Season 2.